Corresponds to events #206-207 (2.5-2.45 Ga), events 191&195 (2.2 Ga), & events #179-181 (2.12-2.10 Ga) in the LIP Record database. Bleeker, W. & Ernst, R.E. (2006) “Short-lived mantle generated magmatic events and their dyke swarms: The key unlocking Earth's paleogeographic record back to 2.6 Ga” In Dyke Swarms—Time Markers of Crustal Evolution, edited by E. Hanski, S. Mertanen, T. Rämö and J. Vuollo, A.A. Balkema Publishers, Rotterdam, in press. The continents preserve a rich record of short-lived mafic magmatic events through time and space. Some of these events, defined as Large Igneous Provinces or LIPs, cover areas larger than 100,000 km2. They represent the most dramatic volcano-magmatic outbursts on the planet. Many of the mafic magmatic events can now be dated routinely and precisely, with a resolution of a couple of million years or better. The spatial and temporal association of these magmatic events with rifting and continental break-up leads to remnants being preserved on originally adjacent (conjugate) margins and respective hinterlands. Now distant pieces of crust that were originally contiguous are thus likely to share remnants of one, if not several, of these magmatic events. The overall record of short-lived magmatic events in a particular fragment of continental crust defines, in essence, a high-resolution “barcode” that characterizes the ancestry of that piece of crust. Crustal fragments that were originally adjacent (i.e. “nearest neighbours”) are thus likely to share part of their barcodes. Even though break-up margins may be severely modified and reworked during subsequent events, and many of the break-up related volcanic rocks may have long been eroded away, associated dyke swarms have high preservation potential and preserve within them the high-resolution spatial and temporal information needed to allow successful paleogeographic reconstructions. Other, independent, but generally more fuzzy geological data can then be used to test specific reconstructions based on the precise “piercing points” provided by the dismembered dyke swarms. 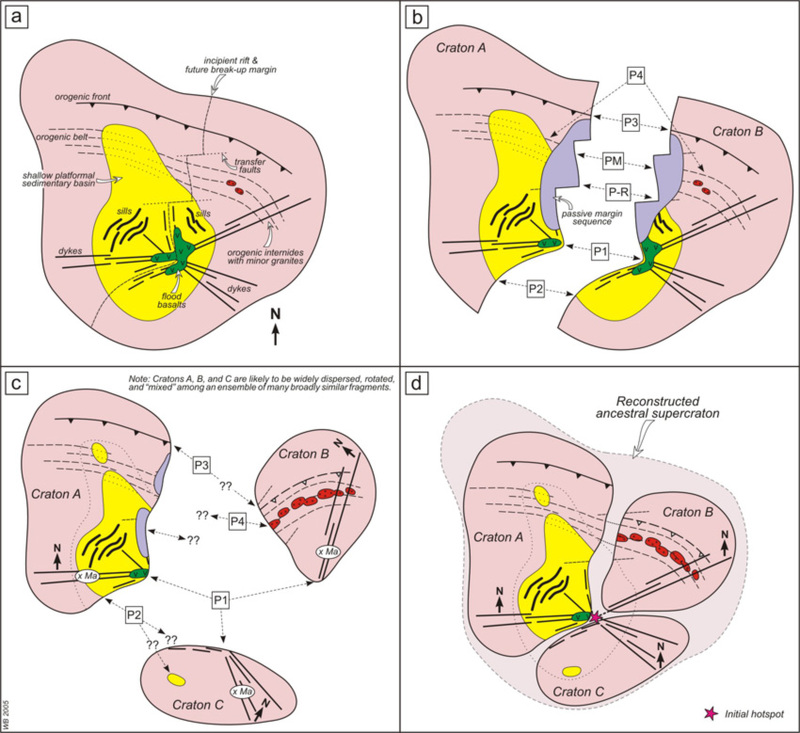 In this contribution we illustrate the methodology using magmatic “barcodes” and “piercing points” and propose a new and detailed reconstruction between the Superior, Hearne, and Karelia cratons. These Archean cratons must have formed the core of a large late Archean to Paleoproterozoic landmass—2.7-2.1 Ga supercraton Superia. Through this reconstruction, scattered fragments of several Paleoproterozoic LIPs, with ages of 2.50 Ga, 2.45 Ga, 2.22 Ga and 2.10 Ga, are rejoined into their original configurations. A successful reconstruction thus allows a more comprehensive understanding of these LIPs as overall magmatic systems. In general, a complete characterization of all fragments of continental crust in terms of their short-lived magmatic event barcodes would be the most efficient way to solve Earth’s pre-Pangaea paleogeographic evolution, as far back as 2.6 Ga. High-resolution U-Pb ages are essential for the construction of these barcodes and are an efficient early filter to focus further work (e.g. paleomagnetism, geochemistry) on the more significant events. Only several hundred new ages would be required to catalyze a quantum leap of progress in this overall field, ultimately allowing a full synthesis of all Precambrian terranes. A fundamental contribution of the geological sciences to the overall body of scientific knowledge is a complete record of Earth’s paleogeography through time. The latter is known in detail only back to ca. 250 Ma, the time of “maximum packing” of supercontinent Pangaea. Prior to 250 Ma, the paleogeographic record of Earth’s continental crust becomes increasingly speculative, although there is growing optimism that this problem may be tractable, in principle, back to ~2.6 Ga, the age of “cratonization” of a considerable fraction of continental crust extant today (e.g. Bleeker 2003). Going back in time beyond Pangaea, an increasing number of “pieces of the puzzle” may be missing or their diagnostic information so thoroughly degraded that any reconstruction suffers, inevitably, from increasing degrees of freedom. Furthermore, in the Precambrian, with at best an incipient fossil record and with paleomagnetic datasets that are commonly complicated by overprinting, our toolkit is severely limited. In the pre-Pangaea world, there is no preserved record of ocean floor spreading to help guide paleogeographic reconstructions. Such reconstructions thus rely on matching details in continental geology from one craton to the next (e.g. Du Toit, 1927, Jefferson 1978, Gower et al. 1990, Dalziel 1991, Karlstrom et al. 1999 and 2001, Sears & Price 2000). In particular, many proposed reconstructions rely on matching “piercing points”: i.e. the points where a linear boundary within a craton—for instance, a major structural lineament—intersects a rifted margins (Figs. 1a & b). Obviously, each well-defined high-angle piercing point must have a conjugate along the margin of another craton. Although a simple and powerful concept, there are many complications. Break-up margins sometimes follow older sutures or crustal boundaries, thus minimizing the number of well-defined high-angle piercing points. Other such piercing points are inherently fuzzy, either geometrically (e.g. a sinuous and transitional orogenic front) or in terms of age (e.g. an anatectic granitoid belt with a range of ages). Yet others are highly susceptible to the degree of uplift and exhumation of the respective margins (e.g. the outline of a shallow, pre-rift, sedimentary basin; see Figs. 1b & c). Any piercing point based on intersection of a shallow or moderately dipping structural feature will shift significantly with differential uplift or will be completely erased from one or both margins, leaving few clues about an ancient connection. Figure 1: Piercing points and craton reconstruction. a) A hypothetical (super)craton with various geological elements, just prior to break up. A large igneous province, with flood basalts and associated dykes and sills, is emplaced along the incipient rift. b) Break up of the supercraton has spawned to cratons (A and B). As long as both cratons are not too modified (e.g. South American and African conjugate margins), they are easily fitted together again using a variety of piercing points and other matching features: e.g. P-R, the fitting of promontories and re-entries along the rifted margins; PM, general correlation and fitting of the conjugate passive margins; P1, piercing points and reconstruction of the large igneous province; P2, piercing points provided by older sedimentary basins; P3, piercing points provided by an ancient orogenic front or fold-thrust belt; and P4, the non-precise piercing points provide by orogenic internides. c) The more general case where further break up has occurred (craton C) and craton margins have been abraded, modified, and differentially uplifted. Craton B was strongly uplifted and its sedimentary cover has been eroded. Piercing point P3, if still recognizable as such, has strongly shifted, and an exhumed granitoid belt is unmatched in craton A. Craton C was also uplifted, erasing piercing point P2. Dykes related to the large igneous province, however, remain on all three cratons and precise age dating (x Ma) yields a critical clue that they might be part of a single event. Primary paleomagnetic data may yield additional geometrical clues (North arrows), if not paleolatitudes. d) Reconstruction of the original supercraton, based only on the precise piercing points and other information derived from the dyke swarms. Other tools commonly employed to compare or contrast distant margins are statistical patterns of zircon data, either in the form of 1) a variety of somewhat imprecise basement ages, or 2) peaks in detrital zircon “spectra” obtained from cover sequences (e.g. Fitzsimons & Hulscher 2005). Although in some cases this can lead to compelling correlations, the age peaks are commonly too broad, too non-unique or, alternatively, too unique (i.e. provenance modes that are spatially too restricted with no distant match), to allow unambiguous paleogeographic solutions. Of course, all these approaches based on variably fuzzy data are useful and collectively may build a case for a specific paleogeographic correlation, but rarely do they allow an unequivocal “true or false” test of such a correlation. However, as discussed below, the linear shape and vertical attitude of dykes, and their simple swarm geometry (linear or radiating), makes them ideal for the definition of robust and precise piercing points for continental reconstruction (Buchan & Ernst 1997). In the last two decades, our increasing ability to date many short-lived mafic magmatic events (e.g. Krogh et al. 1987, Heaman & LeCheminant 1993), commonly with a precision of ± 1 - 2 Ma or better, has paved the way for the most robust tool in reconstructing ancient continental paleogeographies: integrated mapping, high-precision age dating, and paleomagnetism of short-lived mafic magmatic events and their dyke swarms (e.g. Halls 1982, Fahrig 1987, Buchan et al. 2000, Wingate & Giddings 2000, Ernst et al. 2005, Bleeker 2004, Vuollo & Huhma 2005). Mantle-generated magmatic events are typically short-lived (“burps from the mantle”), often less than a million year and within the resolution of our most precise dating methods (e.g. Marzoli et al. 1999, Kamo et al. 2003; but see Jourdan et al. 2005). Even where an overall event may be longer lived (e.g. 10-30 million year for all components of a large igneous province), they tend to consist of several discrete magma pulses that individually were short-lived. Short-lived magmatic events are commonly associated with continental break-up, thus leaving remnants of the event on the conjugate margins (e.g. Hill 1991). They are spatially extensive, especially their dyke swarms, thus providing a large footprint extending away from craton margins (e.g. Halls 1982). This is important because craton margins are likely to be severely modified in a subsequent collision. Precise age data, and especially paleomagnetic data, can thus be obtained from better preserved distal portions of the events. As described above and as illustrated in Figure 1, because of their shape and attitude, individual dykes or (sub)swarms of related dykes provide superior piercing points (Buchan & Ernst 1997). And because the dyke swarms are generally vertical and have significant depth extent in the crust, these piercing points are essentially insensitive to uplift. Mantle-generated magmatic rocks commonly have a distinct geophysical expression, thus allowing them to be traced aeromagnetically through areas of poor outcrop or below cover rocks. Finally, the mafic magmatic rocks may have distinctive chemistry and isotopic compositions that may strengthen or weaken a specific correlation. Precise age matches among short-lived mafic magmatic events are a first and highly efficient filter to alert us to the possibility that two cratons, now distant, may have been adjacent pieces of crust in an ancestral landmass, i.e. “nearest neighbours” (Bleeker 2003). As explained below, this realization leads to the simple but powerful concept of “barcodes” (Bleeker 2004) to uniquely identify the ancestry of crustal fragments. Obtaining well-populated barcodes for all ca. 35 Archean cratons would be, in our view, the quickest and most efficient way to robust paleogeographic reconstructions. This would require a systematic global dating program of several hundred new and refined high-precision ages (e.g. Bleeker 2004, Ernst et al. 2005). The ultimate goal of such a program should be to have precise ages for every short-lived magmatic event in the geological record. Besides complete and precise age data, it is equally important, of course, that each event is carefully characterized in terms of other key attributes: geological setting, areal distribution, paleomagnetism, geochemistry, etc. There is no doubt that collectively such data would catalyze a quantum leap in understanding not only of pre-Pangaea paleogeography but also of the evolving Earth system as a whole (Bleeker 2004). A critical step in the overall methodology is obtaining precise ages for as many short-lived mafic magmatic events as possible, and from as many as possible crustal fragments and cratons around the world. Precise ages allow the various events to be ordered in time while immediately drawing attention to potential matches, thus highlighting those events that have the most potential for correlation and which of these deserve further work. A number of precisely dated mafic magmatic events within an individual craton yield age bars on a time line, i.e. a “barcode” that provides a quick graphical representation of the short-lived magmatic events within that fragment of crust. Figure 2 shows hypothetical barcodes for five cratons. 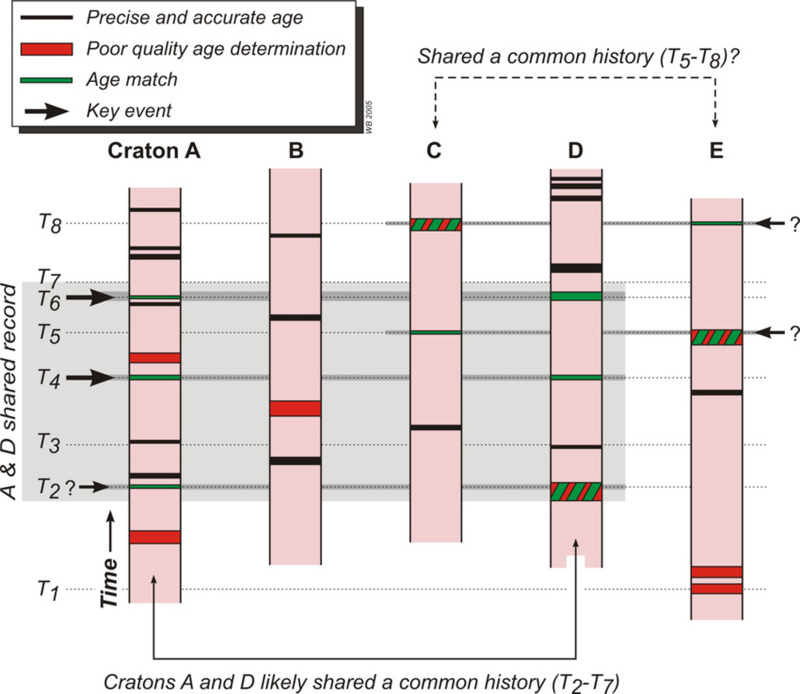 Although all have some unique (“endemic?”) bars, there are two precise age matches between craton A and D, at times T4 and T6, respectively, and potentially a third at T2. Hence, it is exceedingly likely that cratons A and D were adjacent pieces of crust (“nearest neighbours”) in an ancestral supercraton, at least between times T4 and T6, and possibly from before T2 if a refined age of the oldest dykes in craton D would converge on the precise age in A. One can also surmise from the barcodes that cratons A and D likely broke up shortly after T7, as subsequent events in both cratons are distinct. Furthermore, cratons C and E may be nearest-neighbour fragments of another supercraton that existed between T5 and T8. However, at least two of the ages would need to be refined. Finally, craton B, despite a reasonably well-populated barcode, does not share any match with any of the other cratons and therefore likely represents a distant, if not unrelated, fragment of crust (Fig. 2). Figure 2: Hypothetical “barcodes” for five cratons. Individual “bars” are the age range (of variable precision) of short-lived magmatic events on vertical time lines. Partially matching barcodes, e.g. between cratons A and D (from time T4 to T6, and possibly from as early as T2), are a strong indication that the two cratons had a shared history in an ancestral supercraton, i.e. they were “nearest neighbours”. Cratons C and E are unrelated to A and D, but may have shared a common history as part of another supercraton. However, more precise age data are required. Craton B, with no matches, must represent a distant, if not unrelated, fragment of crust. Given three successive age matches between the barcodes of cratons A and D, the geometrical and paleomagnetic information inherent in the dyke swarms should allow a unique fit. As explained below, if the paleomagnetic information proves compromised by overprinting, just the dyke patterns alone may still carry sufficient information for a unique fit. The overall reconstruction should yield a rational dyke swarm pattern (e.g. Fig. 1d), with, for instance, fanning sub-swarms pointing to magmatic centres (“hotspots”). Textural or magnetic anisotropy data may test for a flow direction predominantly away from this centre. Finally, once all the information content of the short-lived mafic magmatic event is exhausted and provides tight constraints on the correlation, one can further test the proposed correlation by comparing other regional geological elements. There is little doubt that this general methodology, if applied systematically and globally, is the most efficient route towards more robust paleogeographic reconstructions. The Superior craton of the Canadian Shield has the most detailed record of Paleoproterozoic mafic magmatic events (Buchan & Ernst 2004, Ernst & Buchan 2004). This is partly a function of location, in a well-exposed and well-studied shield area, but also one of size and tectonic evolution. Acting as the lower plate in most of the marginal Proterozoic belts, reworking of the craton is limited to its outer margins and large portions preserve an essentially primary record of Proterozoic dyke intrusion events and partial remnants of large igneous provinces (LIPs). At least two centres of voluminous 2505-2445 Ma magmatism, comprising the Mistassini radiating dyke swarm in Quebec and the giant Matachewan radiating dyke swarm, associated intrusions, and volcanic rocks in Ontario (Fahrig 1987, Heaman 1997, Halls & Zhang 1998, Ernst & Buchan 2002). Several 2230-2200 Ma dyke swarms and a voluminous sill province of the same age (Buchan et al. 1998, Buchan & Ernst 2004, Corfu & Andrews 1986, Krogh et al. 1987, Noble & Lightfoot 1992). The dyke swarms may define a radiating pattern with a focal point to the east of the craton, from where they are thought to have fed the Nipissing sills intruding in the Huronian Supergroup on the southern flank of the craton (Buchan et al. 1998, Palmer et al., submitted). A prominent dyke swarm at 2125-2100 Ma, the Marathon dykes (Buchan et al. 1996, Hamilton et al. 2002). New work on these dykes has both improved the precision of their ages and demonstrated a radiating pattern with a focal point to the south of Lake Superior (Halls et al. 2005). Craton encircling rift/passive margin sequences of the “Circum-Superior belt” (Baragar & Scoates 1981), with mafic/ultramafic volcanic rocks, sills, and dykes ranging in age from ca. 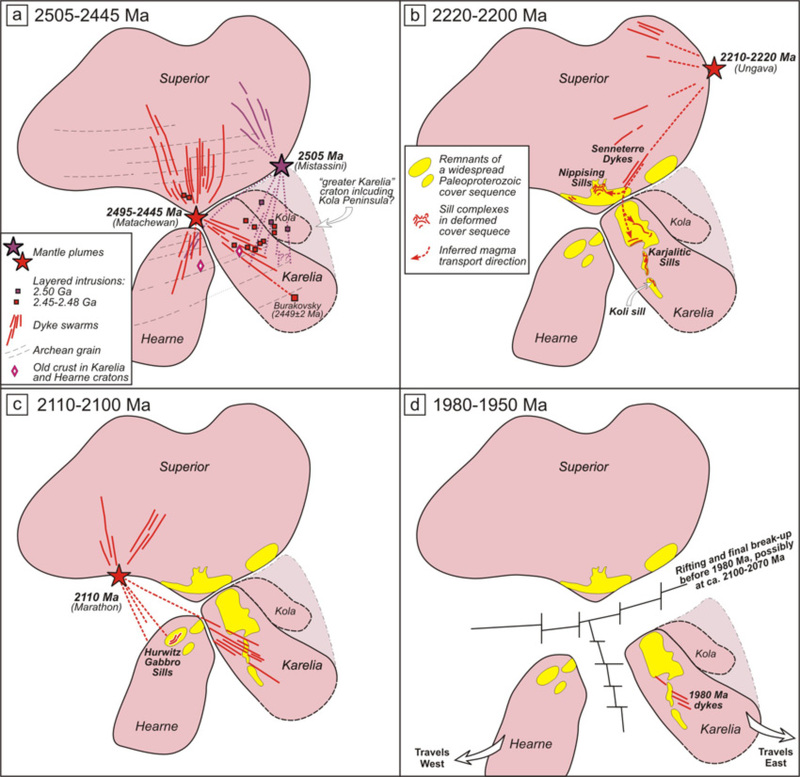 2170 Ma, the first cycle of volcanism in the Labrador Trough (Le Gallais & Lavoie 1982, Skulski et al. 1993, Clark & Wares 2004) to 2048-1860 Ma (see Ernst & Buchan 2004, for various events; see also the “LIP of the Month” feature for May 2004 on this website). Some of the major dykes swarms coeval with these events are the 2167 Ma Biscotasing dykes of Ontario, the 2000 Ma Minto dykes of northern Quebec, and the 1883 Molson dykes of northern Manitoba. Figure 3: Barcodes (2.72-1.80 Ga) for the Superior craton (centre), the Slave (left), and the Hearne and Karelia cratons (right). Note the relatively poor match between the Slave craton and the Superior, indicting that these cratons were distant areas of crust between 2.66 Ga and 1.9 Ga. On the other hand, Karelia, Hearne, and Superior show numerous matches between their barcodes and thus must have been adjacent pieces of crust within ancestral supercraton Superia, which existed from the late Archean across much of the Paleoproterozoic until break-up sometime after 2100 Ma. To illustrate the effectiveness of the barcode methodology, we include in Figure 3 similar data for the smaller Slave, Hearne, and Karelia cratons. Both the Slave and Karelia cratons now have reasonably well-populated barcodes, although much work remains to be done. The Slave craton, with approximately ten well-dated mafic magmatic events, provides an example of a craton that shares few similarities with the Superior craton barcode. Hence, it clearly was not a “nearest neighbour” of the Superior craton in any Paleoproterozic landmass and, in fact, may represent a fragment of unrelated, exotic, crust prior to both cratons becoming incorporated into 1.8 Ga Laurentia. Bleeker (2003) suggested that while the Superior craton is an internal fragment of one large Paleoproterozoic “supercraton”, Superia, the Slave is a fragment of another such supercraton, Sclavia. These two supercratonic landmasses (latest Archean to earliest Paleoproterozoic continents) may never have been connected in a single supercontinent. The Slave craton barcode is presented here as a contrast, but will not be discussed in detail any further. The Karelia barcode is quickly becoming better defined (Vuollo & Huhma 2005), and although age precision needs to be improved, it now matches many of the critical age bars of the Superior barcode (see above; and Fig. 3). Given these multiple age matches, within the precision of currently available data, there can be little doubt that Karelia and Superior cratons represent crustal fragments that were nearest neighbours in Paleoproterozoic supercraton Superia (Bleeker 2003). 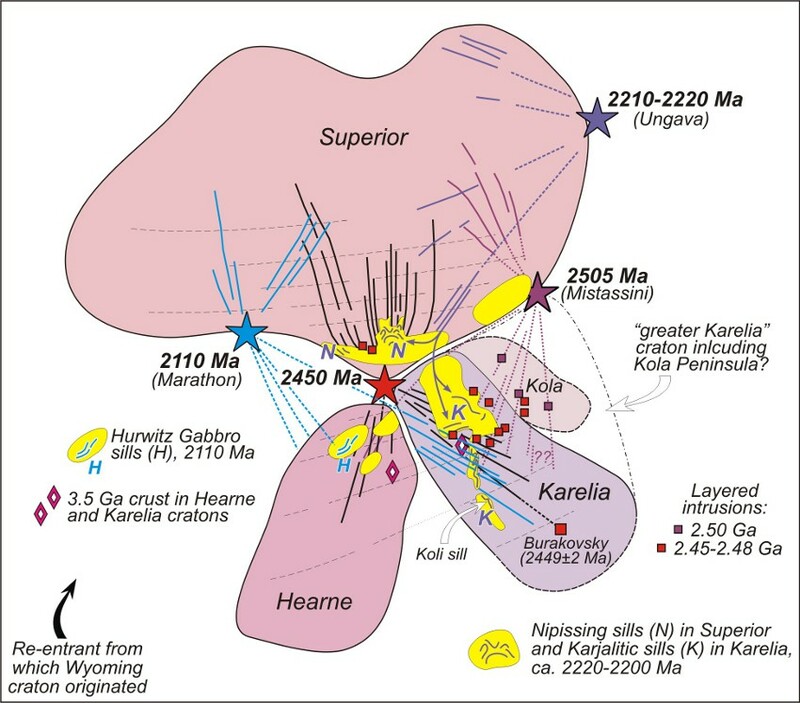 One more inference can be made without considering further data: Karelia likely originated from along the southern margin of the Superior craton (see also Heaman 1997), as it is here that we find the focal points for 2505-2445 Ma and 2125-2100 Ma magmatism, as well as the voluminous 2217 Ma Nipissing sills in the Huronian Supergroup. The latter likely have their equivalent in the Karjalitic sills of Karelia (Vuollo & Huhma 2005). Interestingly, no basement-cutting feeder dykes to these sills have been found in Karelia, suggesting far-travelled transport of magmas as sills within Paleoproterozoic cover or along the underlying unconformity. The key point here is that all these far-reaching and testable inferences are based, thus far, on nothing more than sets of ages and general field relationships of the magmatic events. All the other inherent information can now be brought to bear on testing of these inferences. This is the power of systematic precise age dating and the barcode methodology. Does the age match survive age refinement? Does the age match involve just one event or can it be extended to multiple events across an interval of time? If so, it would greatly strengthen the likelihood of a “nearest neighbours” type correlation. And ultimately, is the suggested correlation supported by paleomagnetic, compositional, and other tests? A single precise age match, by allowing temporal and possibly spatial matching of dyke swarms in two cratons, may quickly suggest a tentative paleocontinental reconstruction. However, the data will typically allow significant freedom in the reconstruction (e.g. detailed placing and orientation of one craton relative to the other), even if relevant paleomagnetic data are available. Errors in inclination and declination in primary paleopoles from both cratons may, collectively, amount to uncertainties of ~10-20 degrees in relative latitude, and ~10-20 degrees in relative orientation, even ignoring polarity ambiguity (Fig. 4a). However, once two dyke swarms can be matched, particularly if they show fanning in both cratons, the fit becomes fully constrained (Fig. 4b). Matching of further events, and (or) other elements of the geology in both cratons can then raise the likelihood of a specific correlation beyond reasonable doubt (Fig. 4c). The example shown in Figure 4c is modeled on the Superior-Hearne correlation proposed by Bleeker (2004), although it should be mentioned that ca. 2110 Ma (Marathon) dykes have not (yet?) been found in the Hearne craton basement. Sills of exactly this age, the Hurwitz gabbros (Heaman & LeCheminant 1993), and a few dykes (e.g. Aspler et al. 2002), do occur however in the cratonic cover of the Hearne craton. Recently, Heaman (2004) suggested that the ca. 2500 Ma event of the Superior (Mistassini) is also present in the Hearne craton among mafic dykes in the Kaminak area, extending a southern Superior-Hearne link (Bleeker 2004) across three events and 400 million years of time. Figure 4: a) “Fitting” of two cratons based on dykes (and paleopoles) from a single event. Note that significant freedom remains in the reconstruction due to insufficient constraints and cumulative errors in the paleopoles. b) A fully constrained fit due to matching dykes that radiate out from more than one magmatic “plume centre” (or hotspot). c) Strengthening of the suggested fit by matching cover sequence stratigraphy and elements of the basement geology, yielding a robust paleogeographic correlation. This diagram is modeled on the Superior-Hearne fit proposed by Bleeker (2004). Following this methodology, there are now sufficient data from both Superior and Karelia to extend this detailed correlation to the Karelia craton (Fig. 5). We propose that Karelia was situated southeast of the southern Superior craton (present coordinates) and adjacent to the Hearne craton from the time of crust formation, accretion, and aggregation in the late Archean to the time of break-up. If correct, all three cratons thus trace their origins back to growth of ancestral supercraton Superia (Bleeker 2003, 2004) by rapid accretion of disparate crustal elements and juvenile crust between ca. 2720 Ma and ca. 2680 Ma. Both southern Superior and Karelian crust underwent high-grade metamorphism between about 2660 Ma and 2640 Ma and thereafter show a shared history of magmatic events and dyke swarm emplacement during the Paleoproterozoic (Fig. 3). Although incipient rifting and extension was locally initiated as early as 2500-2440 Ma, final break-up must have occurred much later, sometime after 2100 Ma. Figure 5: A new correlation for the Superior, Karelia and Hearne craton. The detailed fit is based on successful matching of several short-lived magmatic events, at ca. 2450 Ma (Matachewan), ca. 2217 Ma (Nipissing (N) and Karjalitic (K) sills), and ca. 2110 Ma (Marathon), as well as correlation of the cover sequences (see text). Kola is likely part of this correlation as part of a “greater Karelia” craton. The Wyoming craton likely originated from the re-entrant west of the Hearne craton. Note that our reconstruction successfully places the ca. 3.5 Ga Siurua gneiss of Karelia (diamond symbol; “Europe’s oldest rocks”) along strike of similar age crust in the Hearne craton. Arrows indicate part of the long-distance transport of magma to feed the Nipissing and Karjalitic sills. The key to our reconstruction is the simultaneous and successful matching of ca. 2450 Ma and ca. 2100 Ma dykes to respective magmatic centres in the reference frame of the Superior craton, i.e. the Matachewan and Marathon plume centres or hotspots (Fig. 5). It is possible that ca. 2500 Ma NE-trending dykes are present in Karelia, perhaps interspersed with known 2440 Ma NE-trending dykes, and that they trend towards the Mistassini centre. As magmatic activity of this age is present in Kola, it could be argued that the Kola craton should be an integral part of this reconstruction and part of a “greater Karelia” craton (see Fig. 4d). Although this needs to be tested by more specific data from the Kola Peninsula, it would argue for the ca. 1.9-2.0 Ga, high-grade, Belemoride mobile belt between Kola and Karelia to be the product of intra-cratonic shortening and orogeny of stretched crust, or of the closure of only a narrow ocean basin that temporarily separated Kola from Karelia. Again, the answer to this long-standing question of the relationship between Kola and Karelia is to be found in the Paleoproterozoic dyke swarms of both cratons, not in the complex high-grade metamorphic rocks of the Belemoride orogenic internides. Our analysis further suggests a fairly direct correlation between the Huronian Supergroup overlying the southern Superior and the Sariolan-Jatulian sequences overlying Karelia. Both cover successions are heavily intruded by ca. 2220-2200 Ma sills (Figs. 3 & 5), the Nipissing sills in Canada and Karjalitic sills in Finland, respectively. The Sariolan-Jatulian sequences could show an even stronger correlation with the Hurwitz Group of the Hearne craton. These similarities have been pointed out before (e.g. Ojakangas 1988) but never in the specific spatial context that we are now able to provide. Also, Heaman (1997), keenly aware of some of the emerging age matches, proposed a Superior-Karelia connection, but placed Karelia “up-side down”, i.e. juxtaposing southern Karelia closest to the Huronian margin of the Superior. Both our reconstruction (this study; see Bleeker & Ernst 2006) and that of Heaman (1997) require complex paleomagnetic constraints (Mertanen et al. 1999) to be relaxed. Placing Karelia well to the east of the Superior craton and at higher latitudes (Bleeker 2004) is preferred by the paleomagnetic data (Mertanen et al. 1999) but leads to much less compelling geological correlation. As the paleomagnetic data for Karelia are complex, with multiple components, and not necessarily fully primary (S. Mertanen, pers. comm. 2005), we argue that the remarkable geological fit of Figure 5 outweighs the uncertainty in the paleomagnetic data. Our emerging reconstruction of supercraton Superia with cratonic fragments Superior, Karelia and Hearne in its core, and most likely also involving the Wyoming craton (Fig. 5), can now be used as a more complete reference frame for Paleoproterozoic LIPs (Fig. 6). Magmatic events of the oldest age group are represented by the Mistassini radiating swarm in the southeastern Superior, the Kaminak-I dykes (Heaman 2004) in Hearne craton, and dykes and layered intrusions in the Kola Peninsula (Fig. 6a). In the proposed reconstruction the Kola Peninsula magmatism is sensibly juxtaposed opposite the Mistassini radiating swarm. The correlation of the Kaminak-I dykes of the northern Hearne with the Mistassini centre is equally interesting and would predict that these dykes trend clockwise from the younger Kaminak-II dykes—a field test that has not yet been carried out. Feeders to the Kaminak-I dykes would have to transect either the southern Superior or the northern Karelia craton and be cross-cut by the slightly younger 2.48-2.45 Ga dykes of the Matachewan event (see below). Figure 6: Reconstructed LIPs. a) The ca. 2505 Ma Mistassini LIP and its dykes and layered intrusion (purple); and the ca. 2495-2445 Ma Matachewan LIP, its giant dyke swarm and layered intrusions (red). b) The ca. 2.22-2.20 Ga Ungava LIP, with its radiating dykes and sill complexes in the cover of the southern Superior and Karelia cratons. c) The 2110-2100 Ma Marathon LIP with radiating dykes in the western Superior craton, NW-trending dykes in Karelia, and gabbro sills in the cover of the Hearne craton. d) Final break-up along the southern margin of the Superior craton, separating Karelia from the Superior, sometime after 2100 Ma but prior to 1980 Ma. A prominent dyke swarm of that age occurs in Karelia but has not counterpart in the Superior. It is also the age of juvenile crust production outboard of the two cratons. Events in the 2480-2450 Ma time interval include the Matachewan dykes (and their associated layered intrusions), widespread dykes and layered intrusion in Karelia, and the Kaminak-II dykes (Fig. 6a). A prediction of our reconstruction is that Kaminak-I dykes should trend clockwise rotated from slightly younger Kaminak-II dykes. In Karelia, there are two orthogonal trends of ca. 2450 Ma dykes (Vuollo and Huhma 2005), one pointing toward the 2510 Ma Mistassini centre and the other pointing toward the 2480-2450 Ma centre. One possible implication is that a second stage of 2450 Ma magmatism is associated with the Mistassini centre. In the Superior craton, there are several 2230-2200 Ma dyke swarms and a voluminous sill province of the same age (Buchan et al. 1998, Buchan & Ernst 2004, Corfu & Andrews 1986, Krogh et al. 1987, Noble & Lightfoot 1992). The dyke swarms define a radiating pattern with a focal point to the east of the craton in the Labrador Trough region, from where they are thought to have fed the Nipissing sills intruding in the Huronian Supergroup on the southern flank of the craton (Buchan et al. 1998, Palmer et al., submitted). In the proposed reconstruction, the widespread Karjalatic sills of Karelia are juxtaposed adjacent to the coeval Nipissing sills (Fig. 6b). We also predict that, with more extensive dating of magmatic events, the 2220-2200 Ma event (Nipissing and Karjalitic sills) will be indentified into the Hearne craton. An implication of these correlations is that the combined Nipissing-Karjalitic (and Hearne?) sill province may have been fed from the focal point of the radiating swarm, 1300 km to the northeast in the Labrador Trough region of the Superior craton. The 2125-2100 Ma Marathon swarm is prominent in the southern Superior craton (Buchan et al. 1996, Hamilton et al. 2002). New work on these dykes has both improved the precision of their ages and demonstrated a radiating pattern with a focal point to the south of Lake Superior (Halls et al. 2005). In our reconstruction, a dyke swarm in Karelia of this same age is pointed toward this same focal point (Fig. 6c). Furthermore, Hurwitz gabbro sills in the cover of the Hearne craton, dated at 2111 Ma, are likely part of the reconstructed 2.11 Ga Marathon event. The reconstruction thus extends the radiating pattern to nearly 180o and integrates the Hurwitz sill into a broader magmatic event. The Huronian (southern Superior), Sariolan-Jatulian (Karelia), and Hurwitz (Hearne) cover sequences were deposited in intra-cratonic rifts and extensional basins prior to full break-up and , therefore, do not represent true passive margin prisms on rifted craton margins facing open ocean basins. We predict that a ca. 2.3 Ga event, newly identified in Karelia (Vuollo & Huhma 2005), will have counterparts in the Superior and (or) Hearne cratons. The Superior-Karelia-Hearne reconstruction of Figure 5 obviously represents just the beginning of a full reconstruction of Superia. A marked re-entrant is present to the west of the Hearne craton and, following earlier suggestions by Roscoe & Card (1993), it seems likely that the Wyoming craton originated from this location. Better definition of dyke swarms, more precise age dating, and paleomagnetism of key events in the Wyoming craton (e.g. the ca. 2170 Ma dykes described by Harlan et al. 2003) will hopefully allow a final fit of the Wyoming craton in our reconstruction. On the east side of our reconstruction there is a long “unsatisfied” margin from where other Archean cratons must have originated. In our view, the Yilgarn craton of Western Australia is one of the likely candidates. Ancient basement in Karelia, e.g. the 3.5 Ga Siurua gneiss (Mutanen & Huhma 2003; see small diamond symbol in Fig. 5) likely correlates with ancient crust known in the southern Hearne craton (van Breemen et al. 2005, Loveridge et al. 1988). Archean structural trends in Karelian basement are likely to have been at high angle to the strong NW-SE structural trends of the nearly penetrative Svecofennian overprint. 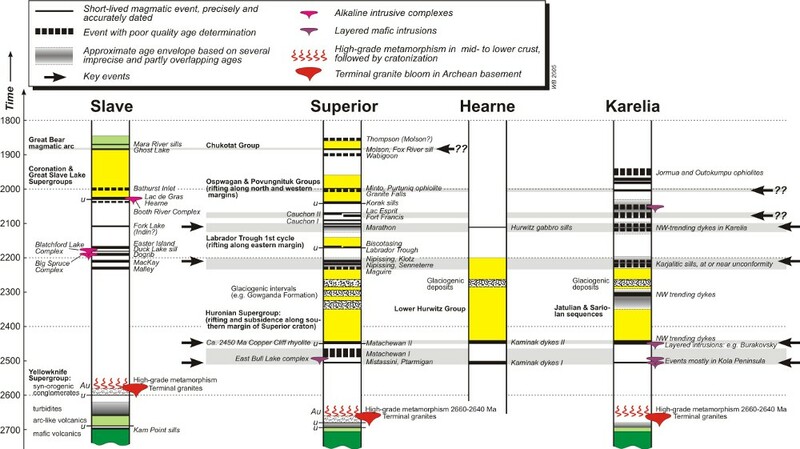 Similarly, in the Hearne craton, original Archean basement structural trends were likely ENE-WSW, subparallel to the dominant structural grain of the southern Superior craton but at a n angle to the present NE-SW Paleoproterozoic structural overprint. And finally, Karelian basement terranes, including Paleo- to Mesoarchean nuclei referred to above (and their analogues within the Hearne craton), represent the next crustal elements in the southward continuation of the Superior craton (within the context of a rapidly southward growing supercraton Superia). From a Superior craton perspective they represent the “missing terranes” that accreted and collided with other southern Superior terranes to cause the final stages of the Kenoran orogeny. Now that we have a spatially and geometrically correct reference frame for the various cratons there is little doubt that numerous other important insights will emerge from a detailed integration and synthesis of their respective geological databases. Also, with knowledge of the initial relative positions of the cratons within supercraton Superia, and of their final positions within 1.8 Ga supercontinent Nuna, we can begin to constrain relative plate motions during the “Hudsonian-Svecofennian” orogenic cycle in some detail. Paleocontinental reconstructions are of critical importance to synthesizing the complex and fragmented geological record of the continents. A relatively complete time series of such reconstructions back to ~2.6 Ga would be a crowning achievement of the plate tectonic revolution. Although much work remains to be done, and while some pieces of the puzzle may no longer exist, we think this goal is achievable. Presently, however, many proposed reconstructions remain underconstrained because of the complex and fuzzy nature of the data available for correlation. Over the last two decades, short-lived mantle-generated magmatic events, and the information inherent therein, have emerged as the key to unravelling pre-Pangaea paleocontinental reconstructions. Multiple precisely dated events define “barcodes” for individual cratons or crustal fragments and provide an efficient representation of the short-lived magmatic events experienced by that piece of crust. Originally adjacent pieces of crust (“nearest neighbours”) are likely to share at least part of their magmatic history, perhaps in the form of distant dykes, and thus will show a partial match between their barcodes. Multiple matches among the barcodes of now distant cratons almost certainly imply that the cratons were adjacent parts of an ancestral landmass. A global age dating program of all short-lived magmatic events is thus the most efficient route to more robust reconstructions, potentially as far back as 2.6 Ga. Matching a single event across two cratons may result in a reasonable correlation but typically will remain underconstrained. Matching of two or more dyke swarm events has the potential to provide fully constrained geometrical solutions (piercing points), which can then be tested further with independent information (paleomagnetic data, details in basement geology). A robust ca. 2.6-2.1 Ga connection between the Superior, Hearne, and Karelia cratons is presented as an example of this approach. Three events (ca. 2500 Ma, ca. 2446 Ma, and ca. 2110 Ma) are now matched between the southern Superior and the Hearne craton. Amazingly, these include all precisely dated mafic magmatic events in the Hearne craton known to date. The Hurwitz gabbro sills in the cover of the craton, dated at 2111 Ma, are likely part of the Marathon event. Between the Superior and Karelia cratons no less than four key events can now be matched, allowing a tightly constrained fit (Fig. 5). Break-up of these cratons must have occurred sometime after 2100 Ma but before 1980 Ma (Figs. 6c & d), the date of an important magmatic event in Karelia (numerous dykes) that has no match in the southern Superior craton. This implies that the Huronian, Sariolan-Jatulian, and Hurwitz cover sequences formed in intra-cratonic rifts and extensional basins and do not represent true passive margin prisms on rifted craton margins facing open ocean basins. Aspler, L.B., Cousens, B.L. & Chiarenzelli, J.R. 2002. Griffin Gabbro sills (2.11 Ga), Hurwitz Basin, Nunavut, Canada: long-distance lateral transport of magmas in western Churchill Province crust. Precambrian Research 117: 269-294. Baragar, W.R.A. & Scoates, R.F.J. 1981. The Circum-Superior Belt; a Proterozoic plate margin? In A. Kröner (ed) Precambrian Plate Tectonics: 297-330. Amsterdam: Elsevier. Bleeker, W. 2003. The late Archean record: A puzzle in ca. 35 pieces. Lithos 71(2-4): 99-134. Bleeker, W. 2004. Taking the pulse of planet Earth: A proposal for a new multi-disciplinary flagship project in Canadian solid Earth Sciences. Geoscience Canada 31(4): 179-190. Bleeker, W. & Ernst, R.E. 2006. Short-lived mantle generated magmatic events and their dyke swarms: The key unlocking Earth's paleogeographic record back to 2.6 Ga. In Dyke Swarms—Time Markers of Crustal Evolution, edited by E. Hanski, S. Mertanen, T. Rämö and J. Vuollo, A.A. Balkema Publishers, Rotterdam, in press. Breemen, van, O., Peterson, T.D. & Sandeman, H.A. 2005. U-Pb zircon geochronology and Nd isotope geochemistry of Proterozoic granitoids in the western Churchill Province: intrusive age pattern and Archean source domains. Canadian Journal of Earth Sciences 42: 339-377. Buchan, K.L. & Ernst, R.E. 1997. Restoration of the primary geometry of giant dyke swarms: constraints on paleocontinental reconstructions. Geological Association of Canada, Program with Abstracts 22: A-20. Buchan, K.L. & Ernst, R.E. 2004. Diabase dyke swarms and related units in Canada and adjacent regions. Geological Survey of Canada Map No. 2022A, scale 1:5,000,000. Buchan, K.L., Halls, H.C. & Mortensen, J.K. 1996. Paleomagnetism, U-Pb geochronology, and geochemistry of Marathon dykes, Superior Province and comparison with the Fort Frances swarm. Canandian Journal of Earth Sciences 33: 1583-1595. Buchan, K.L., Mertanen, S., Park, R.G., Pesonen, L.J., Elming, S.-Å., Abrahamsen, N. & Bylund, G. 2000. Comparing the drift of Laurentia and Baltica in the Proterozoic: the importance of key palaeomagnetic poles. Tectonophysics 319(3): 167-198. Buchan, K.L., Mortensen, J.K., Card, K.D. & Percival, J.A. 1998. Paleomagnetism and U-Pb geochronology of diabase dyke swarms of Minto block, Superior Province, Quebec, Canada. Canadian Journal of Earth Sciences 35: 1054-1069. Clark, T. & Wares, R. 2004. Lithotectonic and metallogenic synthesis of the New Quebec orogen (Labrador Trough). Synthesis map and catalogue of mineral deposits. Ressources naturelles, Faune et Parcs, Quebec DP-2004-03. Corfu, F. & Andrews, A.J. 1986. A U-Pb age for mineralized Nipissing Diabase, Gowganda, Ontario. Canadian Journal of Earth Sciences 23(1): 107-109. Dalziel, I.W.D. 1991. Pacific margins of Laurentia and East Antarctica-Australia as a conjugate rift pair: evidence and implications for an Eocambrian supercontinent. Geology 19(6): 598-601. Du Toit, A.L. 1927. A geological comparison of South America with South Africa. With a Palaeontological contribution by F.R. Cowper Reed. Carnegie Institution of Washington, Publication No. 381, Washington. Ernst, R.E. & Buchan, K.L. 2004. Igneous rock associations in Canada 3. Large Igneous Provinces (LIPs) in Canada and adjacent regions: 3 Ga to Present. Geoscience Canada 31(3): 103-126. Ernst, R.E., Buchan, K.L. & Campbell, I.H. 2005. Frontiers in Large Igneous Province research. Lithos 79: 271-297. Fahrig, W.F. 1987. The tectonic settings of continental mafic dyke swarms: failed arm and early passive margin. In H.C. Halls & W.F. Fahrig (eds), Mafic Dyke Swarms; Geological Association of Canada, Special Paper 34: 331-348. Fitzsimons, I.C.W. & Hulscher, B. 2005. Out of Africa: detrital zircon provenance of central Madagascar and Neoproterozoic terrane transfer across the Mozambique Ocean. Terra Nova 17(3): 224-235. Gower, C.F., Rivers, T. & Ryan, B. 1990. Mid-Proterozoic Laurentia-Baltica: An overview of its geological evolution and a summary of the contributions made by this volume. In C.F. Gower, T. Rivers & B. Ryan (eds), Mid-Proterozoic Laurentia-Baltica; Geological Association of Canada Special Paper 38: 1-22. Halls, H.C. 1982. The importance and potential of mafic dyke swarms in studies of geodynamic processes. Geoscience Canada 9: 145-154. Halls, H.C. & Zhang, B. 1998. Uplift structure of the southern Kapuskasing zone from 2.45 Ga dike swarm displacement. Geology 26: 67-70. Halls, H.C., Davis, D.W. & Stott, G.M. 2005. Paleomagnetism and U-Pb dating of Proterozoic dykes: A new radiating swarm and an increase in post-Archean crustal rotation westwards from the Kapuskasing Zone, Ontario. Geological Association of Canada, Abstract Volume 30: 78. Hamilton, M.A., Davis, D.W., Buchan, K.L. & Halls, H.C. 2002. Precise U-Pb dating of reversely magnetized Marathon diabase dykes, and implications for emplacement of giant dyke swarms along the southern margin of the Superior Province. Radiogenic Age and Isotopic Studies, Report 15, Geological Survey of Canada, Current Research 2002-F6, 8 p. (online www.nrcan.gc.ca/gsc/bookstore). Harlan, S.S., Geissman, J.W. & Premo, W.R. 2003. Paleomagnetism and geochronology of an early Proterozoic quartz diorite in the southern Wind River Range, Wyoming, USA. Tectonophysics 362: 105-122. Heaman, L.M. 1997. Global mafic magmatism at 2.45 Ga: Remnants of an ancient large igneous province? Geology 25(4): 299-302. Heaman, L.M. 2004. 2.5-2.4 Ga global magmatism: Remnants or supercontinents or products of superplumes. Abstracts with Programs, Geological Society of America 36: 255. Heaman, L.M. & LeCheminant, A.N. 1993. Paragenesis and U-Pb systematics of baddeleyite (ZrO2). Chemical Geology 110(1-3): 95-126. Hill, R.I. 1991. Starting plumes and continental break-up. Earth and Planetary Science Letters 104(2-4): 398-416. Hoffman, P.F. 1991. Did the breakout of Laurentia turn Gondwana inside out? Science 252: 1409-1412. Jefferson, C.W. 1978. Correlation of middle and upper Proterozoic strata between northwestern Canada and South and Central Australia. Geological Society of America, Abstracts with Programs 10: 429. Jourdan, F., Feraud, G., Bertrand, H., Kampunzu, A.B., Tshoso, G., Watkeys, M.K. & Le Gall, B. 2005. Karoo large igneous province: Brevity, origin, and relation to mass extinction questioned by new 40Ar/39Ar age data. Geology 33: 745-748. Kamo, S.L., Czamanske, G.K., Amelin, Y., Fedorenko, V.A., Davis, D.W. & Trofimov, V.R. 2003. Rapid eruption of Siberian flood-volcanic rocks and evidence for coincidence with the Permian–Triassic boundary and mass extinction at 251 Ma. Earth and Planetary Science Letters 214(1-2): 75-91. Karlstrom, K.E., Åhall, K.I., Harlan, S.S., Williams, M.L., McLelland, J. & Geissman, J.W. 2001. Long-lived (1.8-1.0 Ga) convergent orogen in southern Laurentia, its extensions to Australia and Baltica, and implications for refining Rodinia. Precambrian Research 111(1-4), 5-30. Karlstrom, K.E., Harlan, S.S., Williams, M.L., McLelland, J., Geissman, J.W. & Åhall, K.-I. 1999. Refining Rodinia: geologic evidence for the Australia-Western U.S. connection in the Proterozoic. GSA Today 9: 1-7. Krogh, T.E., Corfu, F., Davis, D.W., Dunning, G.R., Heaman, L.M., Kamo, S.L., Machado, N., Greenhough, J.D. & Nakamura, E. 1987. Precise U-Pb isotopic ages of diabase dykes and mafic to ultramafic rocks using trace amounts of baddeleyite and zircon. In H.C. Halls & W.F. Fahrig (eds), Mafic dyke swarms, Geological Association of Canada, Special Paper 34: 147-152. Le Gallais, C.J. & Lavoie, S. 1982. Basin evolution of the Lower Proterozoic Kaniapiskau Supergroup Central Labrador miogeocline (Trough), Québec. Bulletin of Canadian Petroleum Geology 30: 150-166. Loveridge, W.D., Eade, K.E. & Sullivan, R.W. 1988. Geochronological studies of Precambrian rocks from the southern District of Keewatin. Geological Survey of Canada, Paper 88-1. Marzoli, A., Renne, P.R., Piccirillo, E.M., Ernesto, M., Bellieni, G. & De Min, A. 1999. Extensive 200-million-year-old continental flood basalts of the Central Atlantic Magmatic Province. Science 284: 616-618. Mertanen, S., Halls, H.C., Vuollo, J.I., Personen, P.J. & Stepanov, V.S. 1999. Paleomagnetism of 2.44 Ga mafic dykes in Russian Karelia, eastern Fennoscandian Shield—implications for continental reconstructions. Precambrian Research 98: 197-221. Mutanen, T. & Huhma, H. 2003. The 3.5 Ga Siurua trondhjemite gneiss in the Archean Pudas-järvi granulite belt, northern Finland. Bulletin of the Geological Society of Finland 75(1-2): 51-68. Noble, S.R. & Lightfoot, P.C. 1992. U-Pb baddeleyite ages of the Kerns and Triangle Mountain intrusions, Nipissing Diabase, Ontario. Canadian Journal of Earth Sciences 29: 1424-1429. Ojakangas, R.W. 1988, Glaciation: an uncommon "mega-event" as a key to intracontinental and intercontinental correlation of early Proterozoic basin fill, North American and Baltic cratons. In K.L. Kleinspehn & C. Paola (eds), New perspectives in basin analysis: 431-444. New York: Springer-Verlag. Palmer, H.C., Ernst, R.E. & Buchan, K.L., submitted. Magnetic fabric studies of the Nipissing sill province and Senneterre dykes, Canadian Shield and implications for emplacement. Canadian Journal of Earth Sciences. Roscoe, S.M. & Card, K.D. 1993. The reappearance of the Huronian in Wyoming: rifting and drifting of ancient continents. Canadian Journal of Earth Sciences 30: 2475-2480. Sears, J.W. & Price, R.A. 2000. New look at the Siberian connection: No SWEAT. Geology 28: 423-426. Skulski, T., Wares, R.P. & Smith, A.D. 1993. Early Proterozoic (1.88-1.87 Ga) tholeiitic magmatism in the New Québec orogen. Canadian Journal of Earth Sciences 30: 1505-1520. Vuollo, J. & Huhma, H. 2005. Paleoproterozoic mafic dikes in NE Finland. In M. Lehtinen, P.A. Nurmi & O.T. Rämö (eds), Precambrian Geology of Finland – Key to the Evolution of the Fennoscandian Shield: 193-235. Amsterdam: Elsevier Science BV. Wingate, M.T.D. & Giddings, J.W. 2000. Age and paleomagnetism of the Mundine Well dyke swarm, Western Australia: Implications for an Australia-Laurentia connection at 755 Ma. Precambrian Research 100: 335-357. Wingate, M.T.D., Pisarevsky, S.A. & Evans, D.A.D. 2002, Rodinia connection between Australia and Laurentia: No SWEAT, no AUSWUS? Terra Nova 14(2): 121-128. So named because the large Superior craton must have been a central piece in this cratonic landmass (see Bleeker, 2003). Similar to the more general “time-space plots” but with a strong emphasis on the short-lived magmatic events with their precise ages and their large spatial footprints, i.e. high-resolution signatures of large segments of crust.